Elected officials in the Big Bend region are getting increasingly involved with a planned pipeline that would bring natural gas from producers in the Permian Basin to Mexican power plants. 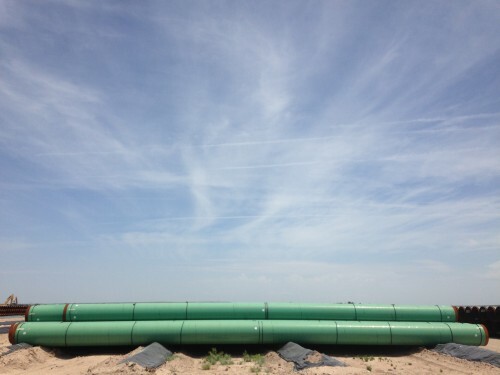 Dallas-based Energy Transfer is building the 143-mile, 42″ Trans-Pecos Pipeline. Local activists and ranchers in Presidio and Brewster Counties have been organizing against it for months. Now, after pressure from those grassroots efforts, the counties are asking the government for stricter federal regulations on the pipeline. 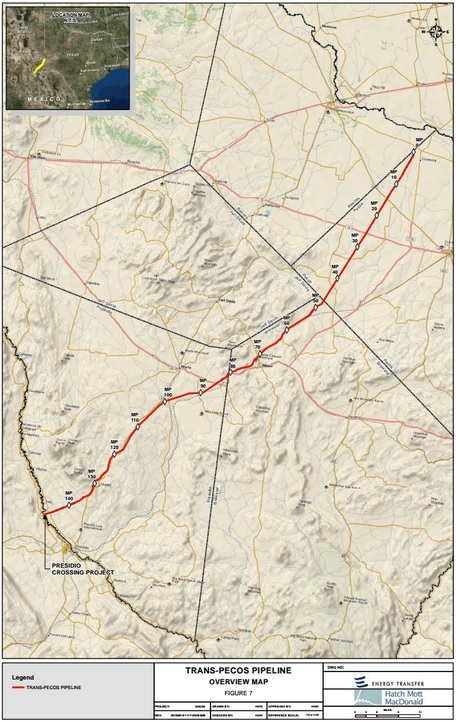 As it stands, the Federal Energy Regulatory Commission (FERC) only has jurisdiction over a small part of the pipeline that will stretch halfway across the U.S.-Mexico border, where it would connect with another line coming from the Mexican side. The Railroad Commission of Texas has authority over the rest. FERC is currently reviewing a “presidential permit” application for the pipeline – the government approval needed for it to stretch across the border – but both Big Bend counties say they want the government to regulate the pipeline’s entire length. “We feel that if we’re gonna keep it safe at the end, that it be safe from the hub all the way to where the custody is taken over by Mexico,” said Brewster County Judge Eleazar Cano. He hopes expanding the fed’s jurisdiction would lead to stricter safety and environmental controls than what the Railroad Commission requires. Most of the pipeline would run through rugged ranchland with not a lot of people nearby, but Cano’s most worried about the part that’s expected to run through the Alpine area. “If something were to happen on that part of the pipeline, or going through the residential area [of Sunny Glenn], those are our main concerns,” he said. Dr. Fred Beach with the University of Texas’ Energy Institute says it’s “highly unlikely” that FERC would agree to the county’s request. He says doing so could turn the pipeline debate into a federal vs. states’ rights issue. “And as we know very well here in Texas, we get our hackles up pretty quick whenever the fed – or in our opinion the fed – starts to overstep their authority within a states’ right issue,” he said. The two counties’ requests appear to be unprecedented. “While it is not unusual for parties to raise questions regarding the scope of the Commission’s jurisdiction in certain types of proceedings, I’m not aware of previous FERC cases that raise issues that are on point with those raised by Brewster and Presidio Counties,” said FERC spokesperson Tamara Young-Allen. Beach says while West Texans are understandably concerned about a sizable natural gas pipeline running through the only part of the state not yet touched by industry, the issue’s bigger than the Big Bend. He says giving Texas producers a huge new market in Mexico, while helping expand Mexico’s energy sector, would make it hard to convince the government it’s a bad thing. After all, the U.S. wants to be a good neighbor. “So I think at the national level, this will be seen as us helping out Mexico in a lot of ways,” he said. But that’s exactly opponents’ problem with the pipeline. It’s designated a gas utility (aka public utility) by the Railroad Commission, the idea being it’s supposed to be in the public interest of Texans, but opponents say the public it would benefit is in Mexico, not in the Big Bend. The opposition group Big Bend Conservation Alliance authored Presidio County’s filing to FERC. The group has also filed its own comments against the pipeline, as has the Sierra Club’s Lone Star Chapter. FERC says it won’t address the counties’ request until the commission decides on the pipeline’s border permit. That could take more than a year, but Energy Transfer says it expects a decision before the end of this year. The local response in Alpine has been more explicit. Alpine Mayor Avinash Rangra wants FERC to deny Energy Transfer’s presidential permit. FERC did approve a similar permit for an Energy Transfer pipeline in South Texas last year. This entry was posted in KRTS News and tagged big bend, Big Bend Conservation Alliance, Brewster County, Energy, Energy Transfer, Federal Energy Regulation Commission, Industry, Oil and Gas, Permian Basin, Presidio County, Texas Railroad Commission, Trans Pecos Pipeline. Bookmark the permalink.